Your application is your opportunity to shine. Tell us about your dreams, passions, and plans to change the world through business. To get started, click “Apply Now”, fill in the requested information, attach the required documents and click submit. 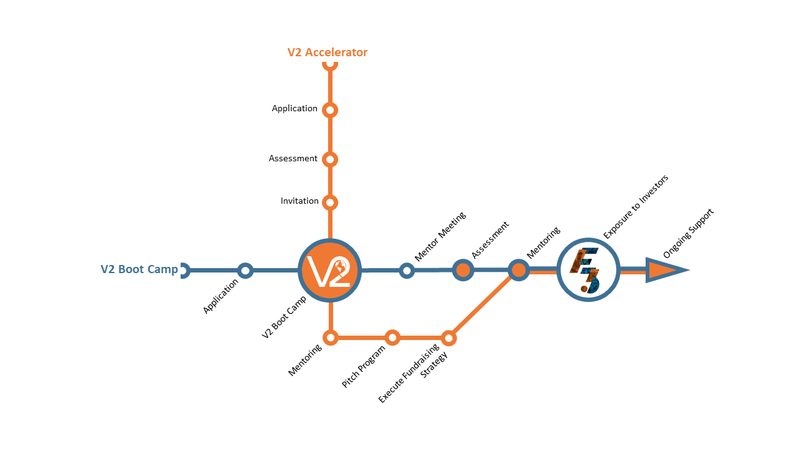 Your assessment should determine your readiness for our V2 accelerator program. Upon acceptance you will be issued an invitation to participate in the V2 Accelerator and attend a V2 Boot Camp. In the V2 Boot Camp you will join a group of like minded entrepreneurs as a part of a cohort in a collaborative learning environment. This intensive program will provide you with an opportunity to build your entrepreneurial skill set for successful execution of your business plan and your mind set for making a significant Kingdom impact. Following the V2 Boot Camp you will work one-on-one with a mentor for a 10-week period. The V2 Accelerator culminates with a demo day. You will showcase your business and record your pitch for presentation to real impact investors. The top three pitches will be awarded cash prizes. Take what you have learned and use your best pitch to engage with your targeted investors to fund your new venture. Work one-on-one with a mentor. Develop and de-risk your business model, incorporate a true kingdom focus into your enterprise and refine your investment pitch (additional fee). Although we cannot guarantee funding for every venture, we do offer opportunities to pitch your business. Our F3 Pitch Event provides a unique platform to showcase your business before vetted and qualified investors who look to venture village as a source of deal flow. Venture Village is a growing Kingdom business ecosystem. Founders have access to ongoing mentoring, peer groups, industry-specific networks and subject matter experts. Meet one on one with a mentor for 90 minutes and wrap up your boot camp experience. Ask any outstanding questions, and explore next steps (included in V2 Boot Camp registration fee). For those interested in ongoing mentoring and access to investors, we offer a formal assessment process. This assessment will explore your aptitudes for entrepreneurship, how you relate and deal with conflict, and how you best fit into your team. Your business plan will also be assessed as to its problem/solution and product/market fit (additional fee).